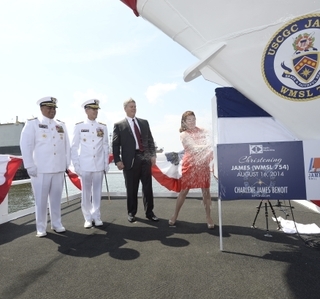 PASCAGOULA, Miss., Aug. 16, 2014 (GLOBE NEWSWIRE) -- Huntington Ingalls Industries' (NYSE:HII) Ingalls Shipbuilding division christened the company's fifth U.S. Coast Guard National Security Cutter (NSC), James (WMSL 754), today in front of nearly 1,000 guests. Charlene James Benoit, great-great niece of Capt. 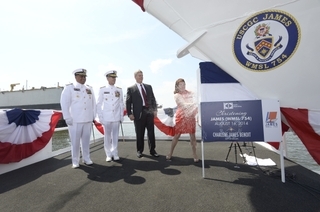 Joshua James, smashes a bottle across the bow of the Ingalls-built National Security Cutter James (WMSL 754). 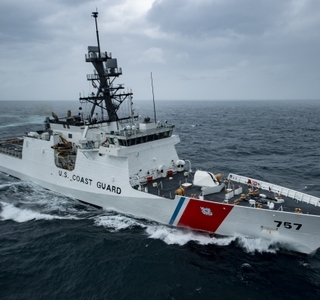 Legend-class NSCs are the flagships of the Coast Guard's cutter fleet. 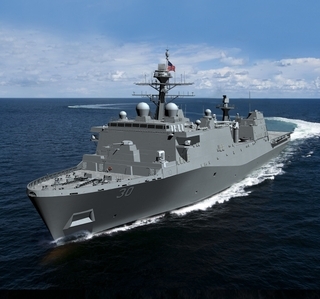 Designed to replace the 378‐footHamilton-class High-Endurance Cutters that entered service during the 1960s, they are 418 feet long with a 54-foot beam and displace 4,500 tons with a full load. They have a top speed of 28 knots, a range of 12,000 miles, an endurance of 60 days and a crew of 110.